Journal : Medical and surgical report[s] of the City Hospital, Boston ; series 1. Description : 71-107 p., [3 l. pl.] ; illus., 2 photos., 1 lith., tbls. ; 26cm. Photographs : 2 tab mounted cards, each with an albumen mounted on a printed border. Subject : Joints — Amputation ; Statistics. Author caption: By David W. Cheever. Appointed staff surgeon, Boston City Hospital, 1870. Succeeded Henry J. Bigelow (1818-1890) as professor of surgery at Harvard. President, American Surgical Association, 1889. Elected President, Visiting Staff of Boston City Hospital, 1891. First endotracheal intubation in etherization, (Boston: D. Clapp & Son, 1867). With John Nelson Borland, 1828-1890, co-editor of the Reports. 22 additional cases reported in series 2 of the Reports (1877, pp. 225-231). Index Medicus: 10404041340, 10202611060 (parent volume). Series One of the Reports, co-edited by Dr. David Williams Cheever, are statistical accounts of 6,585 patients treated at Boston City Hospital during the first five years of its existence, from the day the institution first opened its doors in 1864. An additional 19,000 out-patients were treated in this time and by 1868 it was already evident the hospital needed to expand by another 500 beds in order to care for the health of its burgeoning population. Article III, pages 108-155, is titled Cases of Pneumonia and was written by Dr. Borland, Cheever's co-editor of the Reports. Article VI, pages 235-273, is titled, Treatment of Skin Diseases, written by Dr. Howard F. Damon and illustrated by three lithographs. Damon reports a case of leucopathia affecting the left side face of an 11 year old girl who seemed to have an associated partial paralysis in the left side of her body. Of photographic interest is the lithograph titled, Lichen Syphiliticus Annulatus, copied from an image that appears in Damon's atlas of dermatology titled, Photographs of skin diseases (Boston : James Campbell, 1870, Plate XVI). Five of the fourteen articles were written by Cheever who was chief of surgery at Boston City. Doctor Cheever graduated from Harvard in 1858 and remained at Harvard throughout his life, in 1893 becoming a Professor Emeritus at the medical school. Before editing the City Hospital Reports with Dr. Borland, Cheever edited the Boston Medical and Surgical Journal in 1868 and remained a regular contributor to that journal, but he is probably best remembered in print for his autopsy report and the forensic testimony which he presented as a government witness at the Lizzie Borden murder trial in 1893. His legacy though, is one of aggressive accomplishments in surgery, carrying forward the legacy bestowed by his father and grandfather. Years later Cheever wrote of his impressions when, as a fourteen year-old boy, his father instructed him to pull up the neck skin of a patient so that a lancet and seton could be passed through. Cheever's father made preparations of dissections in a secret attic chamber and performed radical surgery by reading from textbooks. He was an autodidact whose interventions Cheever described as "bold and hazardous and novel" for a country doctor. Cheever's grandfather served on a privateer vessel called, The Tartar, during the Revolutionary War and was the only surgeon on hand to dress and amputate the limbs of the wounded after a bloody engagment with the British frigate Belisarius. He became a prisoner of war after that battle. The most important of the Cheever Articles is number II (pages 71-107) titled, On excisions of Joints, illustrated by two albumen photographs and a lithograph drawn from a photograph of a father holding his daughter whose elbow was excised. The arresting photos represent the slight form of a young girl, Martha S. by name, whose coxalgia led to an operation to remove the diseased head and neck of her femur. 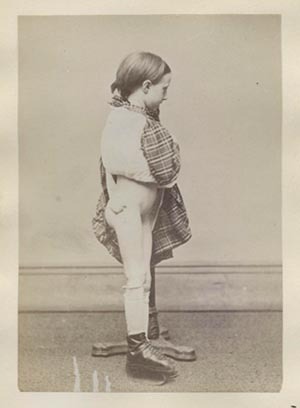 Dr. Cheever makes a compelling argument for aggressive surgery in treating the hip disease of indigent children and he contrasts his circumstances with that of his colleague and friend, Oliver Wendell Holmes, who served Boston's elite and so preferred to operate only as a last resort. He compares his mortality rate of 22% with Holmes's record (6 deaths out of 19 operations), but Cheever points out that these figures omit the spontaneous cures that came as a result of avoiding surgery and which were much more likely to occur among the well-to-do than among the impoverished population served by Boston City Hospital. Cheever leaves it to the reader to arrive at the moral argument adduced by his comparison to Holmes and the mortality tables he provides for London and French operators (85.71% mortality) who were even more reluctant to section a diseased femur.